For the former Brooklyn–Manhattan Transit Corporation 2 service, see R (New York City Subway service). The 2 Seventh Avenue Express is a rapid transit service in the A Division of the New York City Subway. Its route emblem, or "bullet", is colored red since it uses the IRT Broadway–Seventh Avenue Line through most of Manhattan. Wakefield–241st Street-bound 2 train of R142s entering West Farms Square–East Tremont Avenue in the Bronx. Note: Dashed pink line shows limited rush hour service to/from New Lots Avenue. 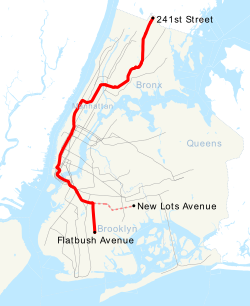 The 2 operates at all times between 241st Street in Wakefield, Bronx and Flatbush Avenue–Brooklyn College in Flatbush, Brooklyn; limited rush hour service originates and terminates at New Lots Avenue in East New York, Brooklyn instead of Flatbush Avenue. Daytime service makes local stops in the Bronx and Brooklyn and express in Manhattan; late night service makes local stops along the entire route. Historically, 2 trains have also run to Crown Heights–Utica Avenue or New Lots Avenue. They ran exclusively on the IRT New Lots Line until 1983, when the 2 was routed to Flatbush Avenue. This is still the case with some rush-hour trains, although they now run to New Lots Avenue only. During weekends in 2017 and 2018, when the Clark Street Tunnel was closed, service ran from Dyre Avenue and/or South Ferry. The first section of what became the current 2 entered service on November 26, 1904, from the temporary 180th Street–Bronx Park terminal via the West Farms El to 149th Street–3rd Avenue. 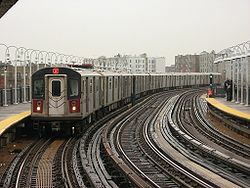 On July 10, 1905, the connection between the IRT Lenox Avenue Line and IRT White Plains Road Line (which was previously served by the Third Avenue El) opened, allowing subway service from Manhattan to the Bronx. On January 9, 1908, the Joralemon Street Tunnel opened, connecting the current IRT Lexington Avenue Line to Brooklyn. At this time, trains ran from East 180th Street to Borough Hall. On May 1, 1908, trains were extended to Nevins Street and Atlantic Avenue. On March 3, 1917, the IRT White Plains Road Line was extended to 219th Street. On March 31, 1917, the IRT White Plains Road Line was extended to 238th Street–Nereid Avenue, and to Wakefield–241st Street on December 13, 1920. On August 1, 1918, the entire IRT Broadway–Seventh Avenue Line was completed. On April 15, 1919, the Clark Street Tunnel, connecting the line to Brooklyn, opened as well. Beginning on December 19, 1919, trains ran to South Ferry with some rush hour trains to Atlantic Avenue. In 1923, during rush hours, 2 trains alternated between South Ferry and Utica Avenue. Beginning December 1, 1924, 2 trains that had ended at South Ferry were extended to New Lots Avenue. As of 1934, 2 trains ran from 180th Street-Bronx Park to Flatbush Avenue weekdays and Saturday during daytime and to South Ferry evenings and Sundays, express in Manhattan. Late-night service was from 241st St to South Ferry, making all stops. There were occasional lay-up/put-ins from New Lots. Four weekday evening trains turned at Atlantic. On September 5, 1937, some evening rush hour trains started running to Flatbush Avenue. As of July 1, 1938, weekday and Saturday evening service was extended to Flatbush Avenue from South Ferry. Sunday service was extended to Flatbush Avenue on March 5, 1950. Beginning on December 26, 1950, alternate weekday rush trains were extended to 241st Street in the peak direction, but PM rush service to 241st Street was discontinued on June 26, 1952. Beginning on August 4, 1952, the 180th Street - Bronx Park station was closed, with trains rerouted to East 180th Street. Morning rush hour service to 241st Street, on October 2, 1953, was cut back to Gun Hill Road. On March 19, 1954, weekend service was rerouted to New Lots Avenue at all times except late nights. On May 4, 1957, a track connection to the IRT Dyre Avenue Line was completed and daytime 2 trains were rerouted to Dyre Avenue. Evening service remained a shuttle between Dyre Avenue and East 180th Street, and morning rush service from Gun Hill Road was discontinued. On December 20, 1957, weekday trains were rerouted to New Lots Avenue at all times except late nights. On June 26, 1958, late night service began between Dyre Avenue and East 180th Street. Beginning on December 12, 1958, late night service was extended to Flatbush Avenue, and the 2 began running express at all times. Beginning February 6, 1959, trains ran between Wakefield–241st Street and Flatbush Avenue at all times except late nights, when they ran between East 180th Street and New Lots Avenue. Beginning on April 8, 1960, daytime service was rerouted from Dyre Avenue to 241st Street, and service in Brooklyn was rerouted from New Lots Avenue to Flatbush Avenue. At the same time, late night service was rerouted from Flatbush Avenue to New Lots Avenue. Beginning on April 18, 1965, evening service was extended from East 180th Street to 241st Street, and in addition daytime service was rerouted from Flatbush Avenue to New Lots Avenue. On July 10, 1983, the 2 and 3 services swapped Brooklyn terminals. Trains began running between Wakefield–241st Street and Flatbush Avenue at all times, making local stops in Bronx and Brooklyn and express stops in Manhattan. This move enabled the 3's equipment to be inspected and maintained at the Livonia Shop, as the 3 service's equipment were assigned to Livonia Yard. In Spring 1995, rush hour 5 service to 241st Street was cut back to Nereid Avenue. 241st Street had insufficient capacity to terminate all 2 and 5 trains during rush hours, requiring some 2 and 5 trips to terminate at Nereid Avenue. To ease passenger confusion regarding which trips terminate where and to provide more reliable service, it was decided to have all 2 trips terminate at 241st Street and have all 5 trains terminate at 238th Street. This recommendation was made in response to comments made as party of the Northeast Bronx Comprehensive Study. From March 2 to October 12, 1998, the IRT Lenox Avenue Line was rehabilitated. On weekdays, 2 trains ran via the IRT Lexington Avenue Line between 149th Street–Grand Concourse and Nevins Street uptown from 5:00 a.m. to midnight and downtown from midnight to 5:00 a.m. On October 3, 1999, the 2 began running local in Manhattan during late night hours. After September 11, 2001, 2 trains ran local in Manhattan at all times so they would not be delayed behind 3 trains terminating at 14th Street. Daytime express service resumed on September 15, 2002. Due to repairs to Hurricane Sandy-related damage on the Clark Street Tube, on weekends between June 17, 2017 and June 24, 2018, the 2 ran between Eastchester–Dyre Avenue in the Bronx and South Ferry in Lower Manhattan, with 5 trains replacing it in Brooklyn and the Bronx north of East 180th Street. Trains ran express only between 96th Street and Times Square–42nd Street during the daytime. ^ a b "2 Subway Timetable, Effective June 24, 2018" (PDF). Metropolitan Transportation Authority. Retrieved June 24, 2018. ^ a b c d e f g h i j k l m n "Line by Line History: White Plains-7th Av. Express". erictb.info. ^ "Discuss Subway Signs in 18th St. Station – Engineer Parsons and Mr. Hedley Inspect Advertising Scheme – Bronx Viaduct Works Well – Delays There Only Those of Newness – Lenox Avenue Service Makes Fuss Below Ninety-sixth Street" (PDF). New York Times. November 27, 1904. Retrieved September 4, 2016. ^ Kahn, Alan Paul (January 1, 1973). Tracks of New York /. New York: Electric Railroaders' Association. ^ "Subway Trains Running from Bronx to Battery – West Farms and South Ferry Stations Open at Midnight – Start Without a Hitch – Bowling Green Station Also Opened – Lenox Avenue Locals Take City Hall Loop Hereafter" (PDF). New York Times. July 10, 1905. Retrieved September 4, 2016. ^ "Annual report. 1916-1917". HathiTrust. Interborough Rapid Transit Company. December 12, 2013. Retrieved September 5, 2016. ^ "White Plains Road Extension of Subway Opened to the Public – New Branch, Which Runs from 177th to 219th Street, Gives the Williamsbridge and Wakefield Sections of the East Bronx Rapid Transit for the First Time" (PDF). The New York Times. March 4, 1917. Retrieved June 11, 2018. ^ "New Subway Line Opened: White Plains Extension is Now Running to 238th Street" (PDF). New York Times. April 1, 1917. Retrieved August 17, 2015. ^ "Subway Line Extended: White Plains Avenue Branch Opens to 241st Street Tomorrow" (PDF). New York Times. December 12, 1920. Retrieved December 20, 2015. ^ Whitney, Travis (Public Service Commissioner) (March 10, 1918). "The Seventh and Lexington Avenue Subways Will Revive Dormant Sections – Change in Operation That Will Transform Original Four-Tracked Subway Into Two Four-Tracked Systems and Double Present Capacity of the Interborough" (PDF). Retrieved August 26, 2016. ^ "New Subway Service Between Brooklyn and Manhattan Boroughs". The New York Times. April 13, 1919. Retrieved September 5, 2009. ^ "IRT Brooklyn Line Opened 90 Years Ago". New York Division Bulletin. New York Division, Electric Railroaders' Association. 53 (9). September 2010. Retrieved August 31, 2016 – via Issu. ^ Christian, Nichole M. (March 3, 1998). "Subway Line Repairs Start With Confusion". The New York Times. ISSN 0362-4331. Retrieved September 23, 2016. ^ "Clark St Tunnel Reconstruction Weekend Service Changes". web.mta.info. Metropolitan Transportation Authority. June 8, 2017. Retrieved May 9, 2018. Wikimedia Commons has media related to 2 (New York City Subway service). "2 Subway Timetable, Effective June 24, 2018" (PDF). Metropolitan Transportation Authority. Retrieved June 24, 2018.